The Microbial Tracking-1 experiment has collected samples of fungi and bacteria from the International Space Station. This fungi sample was collected on May 5 and 6, 2016. At NASA's Jet Propulsion Laboratory in Pasadena, California, Venkateswaran, who goes by Venkat, studies microbial life -- the wild world of organisms too small for us to see with our eyes. Among his many research endeavors, Venkat has leading roles on two microbial experiments that recently returned from the International Space Station. The bacteria and fungi that came back last month will help researchers study how microgravity affects tiny organisms that were deliberately brought from Earth, and what kinds of microbes were already living alongside astronauts. Venkat's curiosity has taken his research from the depths of the ocean to the space station and beyond. His fascination with the survival of life in extreme environments has led to a variety of research endeavors. At JPL, he has become a leading expert in identifying microbes and preventing them from catching a ride on spacecraft. All the while, he has discovered and named 25 new organisms, including 15 since joining JPL. "I like naming new things," Venkat said recently in his office on top of a hill at JPL, near the Mars rover testing area. "All these 39 years of my research, one underlying theme is the rapid detection of microbes -- and some of these had never been detected before." In the late 1970s, when Venkat was in graduate school, microbiology had not yet benefited from advances in technology that have since revolutionized the field. But the world of tiny organisms was fascinating to Venkat, who thought he wanted to study deep-sea microbes. For his first of two Ph.D.s, Venkat studied how microbes help recycle nutrients in seawater at Annamalai University in his native country of India. This led to a five-year stint inspecting the quality of seafood exported from India to other countries. Venkat then became interested in food microbiology. He received a second Ph.D. from Hiroshima University in Japan in 1990, and worked in the food processing industry in Japan. Venkat's expertise came in handy for finding E. coli bacteria causing foodborne illnesses. Venkat's molecular detection methods were able to process 10,000 samples in a week. "I was fortunate enough to see my science implemented right away," Venkat said. "This gave me great personal satisfaction." Venkat then migrated to a different area entirely: oil. A Japanese company hired him to help with the cleanup of the Exxon Valdez oil spill. The spill occurred in Prince William Sound, Alaska, in 1989, but its effects lasted for years. Venkat and colleagues figured out which marine bacteria to introduce into the ecosystem -- a variety that would be harmless to fish but would eat up the oil. A big turning point in Venkat's career was in 1996, when he accepted an invitation to come to the United States to become a senior researcher at the University of Wisconsin, Milwaukee. In January 1998, his advisor moved the laboratory to JPL, and the staff moved with him. It was then that the microbiologist adopted the nickname Venkat, and turned his attention to the idea of life on other planets. What kinds of earthly microbes can survive in space? This question has been a driver of Venkat's research at JPL. Planetary protection -- ensuring that NASA spacecraft do not contaminate other worlds -- is important for planning missions to study Mars and beyond. Spacecraft are built in "clean rooms," which, as the name suggests, are supposed to be free of particles such as dust. These particles can carry bacteria, which has implications for spacecraft built to look for life on other planets -- otherwise, if an instrument detects bacteria, we won't know if it came from Earth or elsewhere. But because people build spacecraft, and people carry invisible bugs in their bodies, being able to detect and control for bacteria is essential in a clean room situation. "Planetary protection required the skills that I have for developing a rapid microbial technology system, so that you can measure the microbial contamination associated with a spacecraft," Venkat said. When Venkat began working at JPL, it took three days to determine the cleanliness of a spacecraft before it was authorized to fly, which was a relatively long time to wait for an analysis of bacteria. Venkat's team worked on methods to hasten the process. Now, within 30 minutes they can determine how many microbes of certain kinds were present, and within eight hours, they can differentiate between dead and live bacteria. Venkat's group has also detected radiation-resistant bacteria that had never been seen before. His track record includes doing planetary protection advising for NASA's Mars Odyssey orbiter, NASA's Mars Exploration Rovers, and the European Space Agency's Mars Express lander. Venkat also studies the health of astronauts in space. This is an especially important issue for long-duration flights, such as trips to Mars. The combination of microgravity and radiation can diminish the effectiveness of the immune system and make innocuous microorganisms potentially harmful -- "double points," as Venkat puts it. The Microbial Tracking-1 experiment, for which Venkat is the principal investigator, is an ongoing effort to study what kinds of microbes are on the space station, both in the environment and in the astronauts' bodies. An October 2015 study in the journal Microbiome found Corynebacterium, which may cause respiratory infection, and Propionibacterium, which may cause acne, in samples that came from an air filter and a vacuum bag from the space station. The most recent payload is the third installment of the Microbial Tracking-1 project. Having done surveys of the kinds of microbes present on the station, Venkat's group will next study how harmful those microbes could be. But some microbes are beneficial to human health. 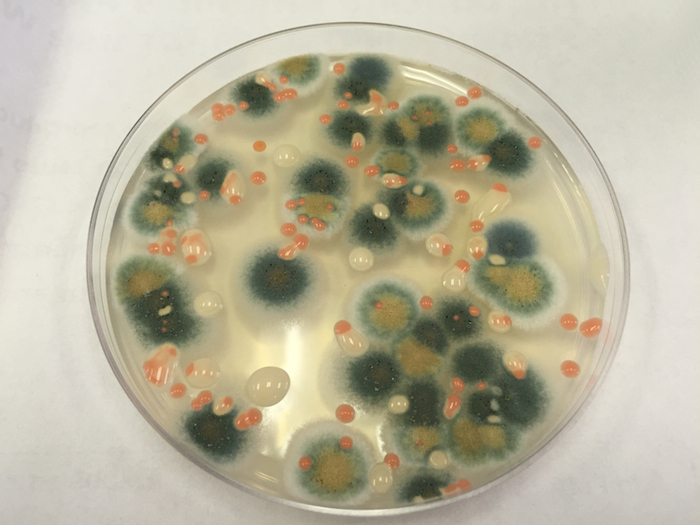 In a different experiment recently on the space station called Micro-10, Venkat and colleagues sent fungi to the space station to see if they produce novel compounds that could be used for medical purposes. There is some evidence that because of the stress of microgravity, fungi could give rise to new substances that could have applications for cancer treatment. Both Microbial Tracking-1 and Micro-10 were payloads managed by NASA Ames Research Center, Moffett Field, California, on the recent SpaceX-8 flight to the space station on April 8, 2016. The work doesn't end there. On the next SpaceX flight to the station, planned for July, Venkat's group is sending eight different fungi. These fungi are special because they were isolated from the area near the Chernobyl nuclear power plant, the site of a devastating accident in Ukraine in 1986. These unique fungi popped up after the accident and grew toward the radiation source. "We are sending these fungi to the space station to see if they produce new compounds that could be used as radiation therapy molecules," Venkat said. Besides investigating bacteria, Venkat enjoys advising and collaborating with young researchers. "The biggest assets for my career, to be where I am right now, are my students and postdocs," he said. He has had more than 20 postdoctoral scholars, 75 college summer students and around 20 graduate students working with him over the course of his career at JPL. "Dr. Venkat showed me and other members of our group that teamwork and collaboration are very crucial while doing research," said Aleksandra Checinska, a postdoctoral scholar at JPL through Caltech in Pasadena, which manages JPL for NASA. "As a young scholar at the beginning of my career, I am privileged to work with a scientist who is open-minded to new ideas and has an unquenchable passion for his work." What is your favorite moment ever in a laboratory? When I found my first new bug: a Salmonella novel species. Bacteria that cause disease, such as salmonella, are most interesting to me. If you could go back in time and meet your 17-year-old self, what would you tell him? You are too busy and might miss some of the teenage fun. So, enjoy the moment. How do you explain your job to someone at a cocktail party who is not a scientist? Looking for life on other planets…and then finding out how microbial contamination of spacecraft will compromise the science. 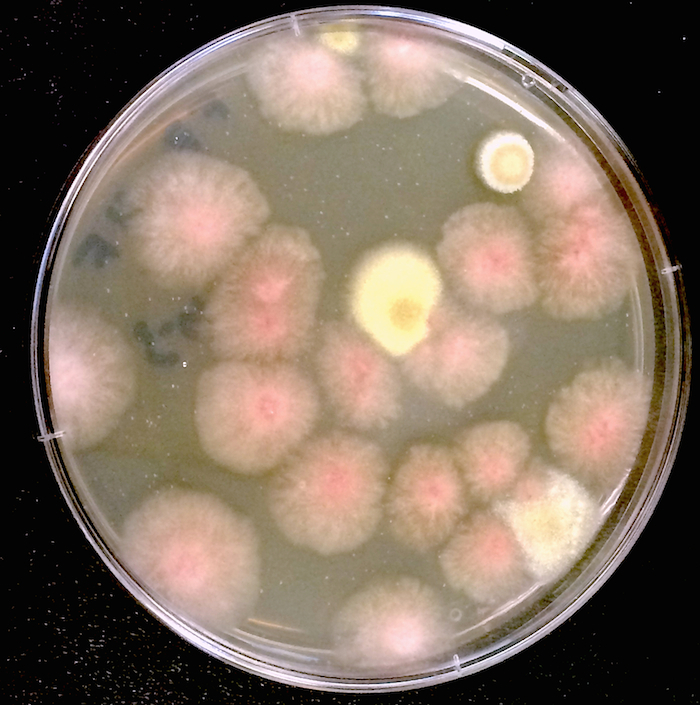 This photo shows a petri dish containing colonies of fungi from the Microbial Tracking-1 experiment. The sample was collected on the International Space Station on May 15, 2015. 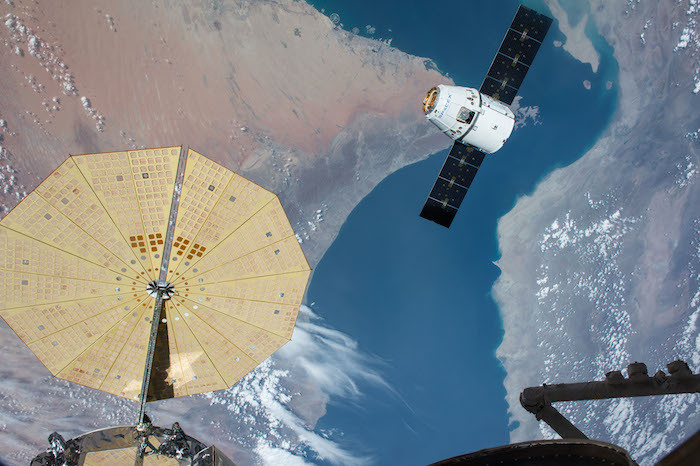 A SpaceX Dragon capsule nears the International Space Station during the CRS-8 mission to deliver experiments including two microbial investigations.